Health – Health is a state of complete physical, mental and social well-being and not merely the absence of disease or infirmity (World Health Organisation 1948). Health literacy – Health literacy is the cognitive and social skills which determine the motivation and ability of individuals to gain access to, understand and use information in ways to promote and maintain good health (World Health Organization). Health promotion – Health promotion is the process of enabling people to increase control over, and to improve, their health. It moves beyond a focus on individual behaviour towards a wide range of social and environmental interventions (World Health Organisation). Health system – A health system (health care system or healthcare system) is the organization of people, institutions, and resources to deliver health care services to meet the health needs of target populations (Wikipedia). Lifestyle – Lifestyle may be simply defined as ‘the way in which a person lives.’ A more elaborate definition adds details to this: Lifestyle is ‘the habits, attitudes, tastes, moral standards, economic level, etc., that together constitute the mode of living of an individual or group.’ On its own the term is neutral and needs to be qualified e.g. a healthy lifestyle or an unhealthy lifestyle. Lifestyle is a term with broader usage than just health. Physical activity — Physical activity is defined as any bodily movement produced by skeletal muscles that requires energy expenditure. Regular moderate intensity physical activity – such as walking, cycling, or participating in sports – has significant benefits for health. For instance, it can reduce the risk of cardiovascular diseases, diabetes, colon and breast cancer, and depression. Moreover adequate levels of physical activity will decrease the risk of a hip or vertebral fracture and help control weight. Public Health – Public health refers to all organized measures (whether public or private) to prevent disease, promote health, and prolong life among the population as a whole. Its activities aim to provide conditions in which people can be healthy and focus on entire populations, not on individual patients or diseases. Thus, public health is concerned with the total system and not only the eradication of a particular disease (World Health Organisation). Self-awareness in health – Self-awareness is the ability to have a clear understanding of one’s own situation, strengths, weaknesses, thoughts and beliefs in health. Self-care – Self-Care is what people do for themselves to establish and maintain health, and to prevent and deal with illness. It is a broad concept encompassing hygiene (general and personal), nutrition (type and quality of food eaten), lifestyle (sporting activities, leisure etc), environmental factors (living conditions, social habits, etc.) socio-economic factors (income level, cultural beliefs, etc.) and self-medication (World Health Organisation 1998). Self-management – Self-management is a term that covers a whole range of things people can do to help themselves live with a long-term health condition. On average, people living with a health condition spend just 3 hours per year with their health care team; the rest of the time they are managing day to day life with that condition by themselves – or self- managing (Self management UK). 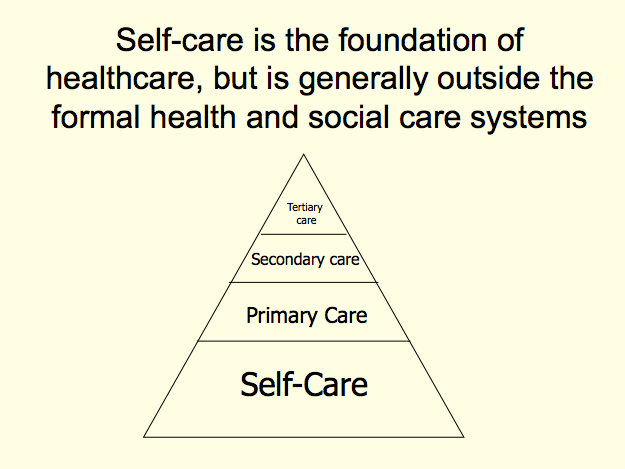 Self-management is therefore self-care by people with a significant existing ailment. Self-medication – Self-medication is the practice whereby individuals treat their ailments and conditions with medicines which are approved and available without prescription, and which are safe and effective when used as directed (World Health Organisation 1998). Wellness – Wellness may be defined as ‘the quality or state of being healthy.’ This term has the advantage that unlike ‘lifestyle’ it is only applied to health. It has the disadvantage that it is commonly used to describe an end state or condition, rather than an ongoing activity. An example of usage is: ‘a healthy lifestyle leads to wellness.’ More recent definitions of wellness have sought to expand the definition, for example: ‘wellness is the quality or state of being in good health especially as an actively sought goal.’ The term wellness is particularly used in the USA. Wellbeing – Wellbeing is often simply defined as feeling good and functioning well. This includes having a fair share of material resources, influence and control, a sense of meaning, belonging and connection with people and place and the capability to manage problems and change. There is much evidence to show that the skills and attributes associated with wellbeing are a core asset, protecting and enhancing the lives of individuals and communities. Improving your wellbeing not only leads to the prevention of disease, but can lead to outcomes that include better physical health, healthier lifestyles, higher educational attainment, greater productivity, employment and earnings and improved quality of life. (Friedli, Lynn. ‘Mental health, resilience and inequalities.’ World Health Organization 2009).